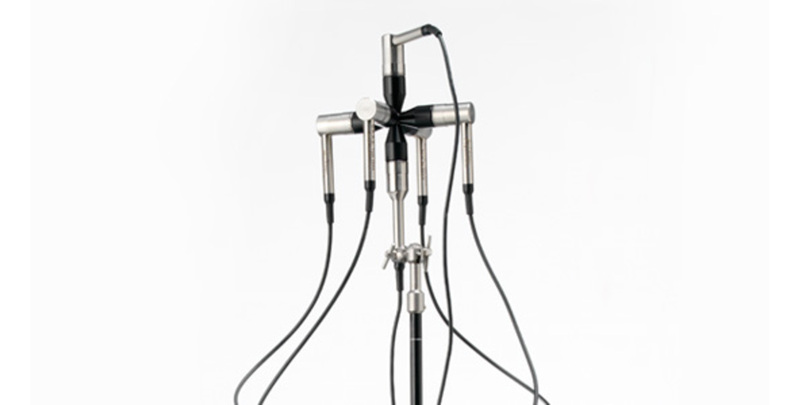 The 50VI-1 full 3-dimensional vector intensity probe complies fully with the requirements in IEC 61043, Electroacoustics - Instruments for the Measurement of Sound Intensity - Measurements with Pairs of Pressure Sensing Microphones, 1993 for Class 1 Sound-intensityprobes, and ISO/DIS 11205.2, Acoustics - Noise emitted by machinery and equipment - Engineering method for the determination of emission sound pressure levels in situ at the work station and at other specified positions using sound intensity. The first generation of sound intensity probes was designed and developed using available standard microphones and preamplfiers, resulting in a number of compromises regarding size, acoustical performance and durability. In the new generation of sound-intensity probes, all components have been made specifically for sound intensity applications. Each small 1/4-inch diameter and 40mm long microphone preamplfier is housed in a robust, stainless steel casing which enables novel probe designs. These novel probe designs reduce the disturbances to the sound field otherwise brought about by the effects of shadows and diffraction, and its symmetry enables reliable calibrations as described in the standard (ISO/DIS 9614-2) for sound power measurements using sound-intensity measurements. The Vector Intensity Probe Type 50VI includes three pairs of GRAS 40AI Sound-intensity microphones, three pairs of GRAS 26AA 1/4-inch Preamplifiers, 25 mm and 50 mm spacers covering the frequency range from 80 Hz to 6.3 kHz. The probe handle has an input for 6 preamplifiers and LEDs for indicating two states as well as a push button for remote control. The remote-controlled output can, for example, be connected to the RS232 port of a computer for controlling the process of data acquisition. The output of the probe handle is a 24-pin LEMO connector and the 50VI includes a 5 m cable terminating in another 24-pin LEMO connector. This can be connected to a break-out adapter with six standard 7-pin LEMO microphone connectors for connection to the GRAS 12AC 6-Channel Power Module for GRAS Vector-intensity Probe.